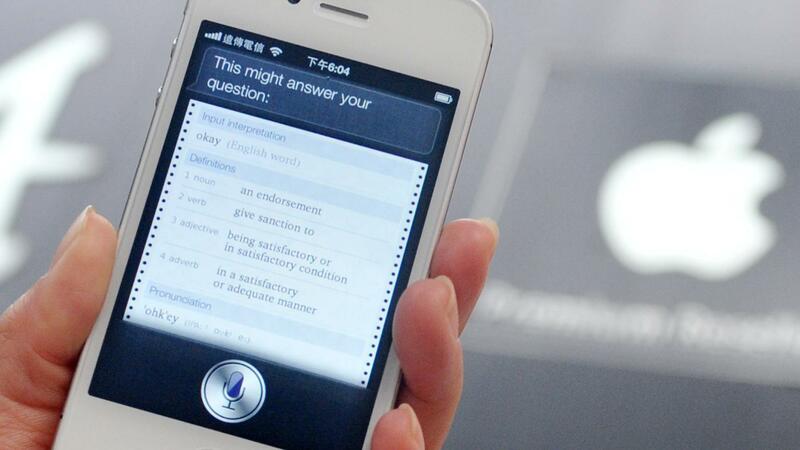 Ask voice questions on an iPhone by talking to Apple's digital assistant, Siri. You can ask Siri questions to find directions, learn about sports events, monitor stock prices and more. Activate Siri by using the home button until the iPhone displays a message that reads "What can I help you with?" Alternatively, iPhone 6 and newer versions can respond when the user calls out Siri by saying "Hey Siri." If using a headset with a call button, hold the button down until you hear a chime. Vehicles that support CarPlay and Eyes Free let the driver press the voice command button on the steering wheel to activate Siri. Once you see the message on the screen or hear the chime, ask a voice question to the iPhone. You may either ask questions to learn more about a certain topic or have a comical conversation with Siri. The digital assistant responds to questions such as "What does the fox say?" To activate Siri with your voice, launch the Settings application, navigate to the General screen, and tap Siri. Turn on Allow "Hey Siri," and follow the instructions to make the iPhone recognize your voice. You can also adjust the gender and the language of the assistant within the Settings application. Siri does not work when the iPhone isn't connected to the Internet. How Do You Find the Unlock Code for an IPhone? What Is the Recommended Way to Charge an IPhone?